There are various ways to submit to the sites. The most common one and the one you will probably use is the fully automated submission. That's possible with Main Menu → Submit → All checked Providers. A dialog as the one above will appear where you can again fine tune the submission process. Only software sites are used to submit to by default. If you plan to submit to other sites, please make sure the content on your pad file is present (Article, Press release content). Some sites want you to place a link to there sites on your site before you start the submission. Simply leave the box unchecked if you don't want these providers. However if you want them, you have to place a link to them. You can do that with the Reciprocal Link Manager. But make sure all links are present before the submission. A lot sites actually don't like automated submissions as it often gets abused by spam bots. They display an image with numbers or chars on it that you have to enter to proof that you are a human. If you don't want to fill them, you have two choices. Either you let it fill out by software like GSA Captcha Breaker or you simply skip the submission to the sites when you uncheck the box. Of course not every site uses the same categories as defines in your pad file. You can define them here. Simply leave that out and the program asks you at the end of the submission to fill categories for sites where no matching one was found. Once you have prepared all, you will be able to start the submission by simply hitting OK. If you have chosen to submit to “image code providers”, you will probably see a screen as above. Just fill the codes and press ENTER or the OK button. 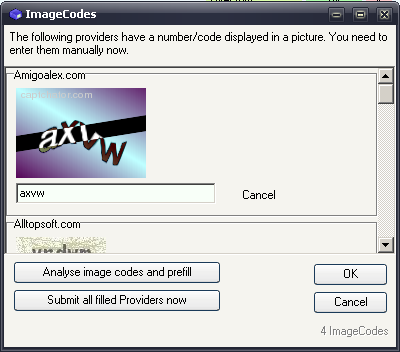 You will only see the codes where the internal analysis of the images failed and where also the captcha service that you might have used failed. At the bottom you see how many captchas are waiting to get filled. The button Analyse image codes and prefill will use the internal analysis function to fill the codes but with a less accurate algorithm. If you use a captcha solution like de-captcher and you still get a lot of captchas to fill; you should higher the timeout value in settings to give the service more time to analyze your captchas and maybe also enable the option to only submit one captcha to the service at a time. At the end of the submission, you will be asked to fill categories for providers where no matching category was found. You can do that while clicking into the Category Class column, or by simply using “Fill by Mask”. 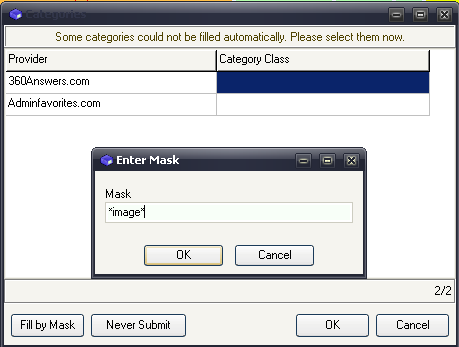 When using the “Fill by Mask” function it will search all categories if they match a certain entered mask. In this case we search for all categories with “Image” in it. A Box will get displayed to you where you can choose the categories that might match your expectations and assign them to your alternative categories. This dialog will appear when all is done…well almost. 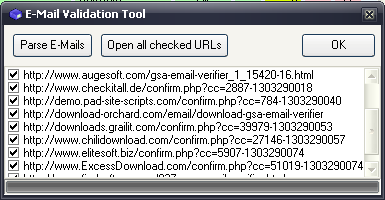 You will get a lot of emails with verification links that you have to click to get the software listed. If you don't click the links, it was a wast of time to submit to them. So you can now either log into your email client and click every link on your own, or simply use the “E-Mail Validation Tool”. You have two options to choose how to parse emails (popup menu when clicking Parse E-Mails) . As you might guess, the emails where a verification link was found get deleted from the server. You should choose this as you will not need the emails anymore once the link has been found and listed in the box. Two options (not seen in outdated screenshot) will allow you to parse out every link or just the links that look like a verification link. The links are there. Now click Open all checked URLs and the verification process is finished and so your site submission.